In this section of swimming pool faq I cover some questions regarding sinking an above ground pool, repairing a wall, finding replacement parts, pool fencing and much more. For a complete list of questions about above ground swimming pools visit the questions index page. Ask the pool pro is a section with hundreds more above ground swimming pool questions and answers and places where you can ask your questions. 63. 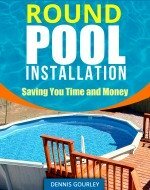 How far can I sink an above ground pool into the ground? Two to three feet is ideal. Any more than that and you run a bigger risk of the pool caving in. You always want to make sure the water level is higher than the dirt. If the pool is too far into the ground and the ground around it gets too wet it could easily cave in. It is also a good idea to wait at least two years after the pool is installed before draining it. This give the dirt around it plenty of time to pack. Even then the pool should be drained and refilled in a day or two. The longer it sits empty the more likely it is to collapse. 64. Can I repair holes in my sidewall or do I have to replace it? Holes in the sidewalls can be repaired safely. If the pool is under warranty and the company will replace it for you that is usually the safest way to go, but if the pool is a used or an older one and you can't afford to replace it, repairs can be made. Please use your best judgment here as I can't be responsible for pools that were not repaired properly and fail. The majority of the water pressure is near the bottom of the pool so be the most careful in this area. 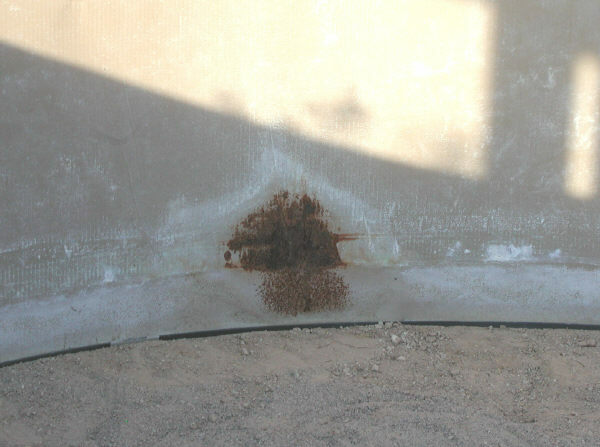 Small rust holes near the bottom of the wall can be repaired by taping long lengths of 12" wide aluminum flashing to the inside of the wall and then covering the bottom half with pool cove. I would not repair holes that are too big in this area because of the large amount of water pressure. Small puncture holes in the wall from the midway point up can be repaired by duct taping any lightweight flat material to the inside of the pool. A lot of times the area around the skimmer will be the first to go. The rest of the pool seems fine but the skimmer just came off in your hand. I would duct tape into place a large piece of flat aluminum or steel to cover the opening and at least another 12" in all directions. I would then cut a new skimmer opening in a better section of wall. Another method I have seen used is to rivet the patch into place and make the new opening in the same place. 65. How far can my filter be from the pool? 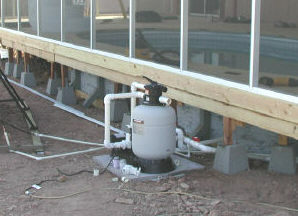 Above ground pool filters are designed to sit next to the pool and be below water level so that they are gravity fed. The farther a filter is placed from the pool the less affective it will be. If you are using standard equipment try to keep it within ten feet of the pool. For longer runs you should consider a larger HP pump. If the pool is in the ground and the equipment is at ground level I would go with an in ground pool pump. They have a different impeller that is designed to draw water out of the ground. 66. Where can I find replacement parts for my above ground pool? There are times when a top rail or upright get damaged and the rest of the pool is still in good shape. To replace these parts you could start by checking all the local pool stores and see if anyone in your area handles parts for that model. You could check with the manufacturers web site and see if they could be of any help. 67. Where can I find fencing for my pool? Sears sells a nice above ground pool fence that is designed to adapt to any model pool. It is made with vinyl so there will be very little upkeep and it will stay looking nice for at least the life of the pool. Vinyl is also lighter than steel so the shipping costs will be less. The fencing is sold in sections so you just buy the amount that you need. 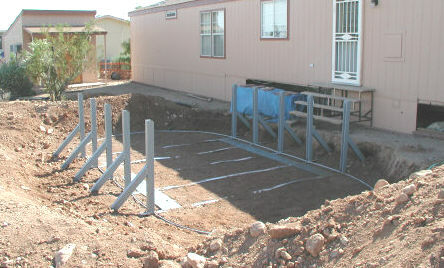 Some of the pool manufacturers offer fencing designed for their specific pools on their web sites. Some of the retail outlets also offer fencing as an option to go with their pools. Pool fencing is a great way to make your pool safer. 68. Can I replace just my sidewall? This is possible but not usually the best option. If you are replacing the wall because of rust it is very likely the bottom rails, footplates and the lower portion of the uprights will also be damaged. Check very closely the condition of the rest of the pool before deciding. Unless you find a great deal on a used one side walls are very expensive. A good quality used pool can sometimes be bought for the same or less than just a new wall. In a lot of cases entire new pools can be bought for less than just a wall. Repairs can also be made to a damaged wall so check all the options before deciding to replace just the wall. 69. The paint is peeling off my top rails, should I replace them? The only time it is really necessary to replace top rails is when they are rusted through or they are bent beyond repair. Most of the time the rails can be removed from the pool, sanded and repainted. I have even seen people take their rails to an auto paint shop to be sand blasted and painted. They come back like new, and in any color you want. 70. You said it is OK for dogs to swim in my pool with me but how can I get them out safely? Some dogs can be trained to climb out using a standard ladder, some may need a little more help. This deck ladder from Sears would probably be just the thing. For more swimming pool FAQ visit these pages.